Barefoot Resort is the newest location for Action Water Sportz in the Myrtle Beach area. We are conveniently located across the bridge at Barefoot Marina. Renting a jet ski for fun or for dolphin watching is one of the most fun activities for any family visiting Myrtle Beach for vacation. Our jet skis will hold up to 3 people and perfect for families with younger children. Each group of Myrtle Beach Jet Ski Rentals is accompanied by a trained guide. Whether you are experienced with jet skis or have never driven one before, we will be there for you. Went out on the dolphin tour, not expecting to see too much at 11am but our guide Randy took us out and we got up close to quite a few. The entire staff was keeping us laughing and we had a great time! Randy was awesome!! 2 hours on the jet ski and some free riding in the open water… well worth it!! We will DEFINITELY be coming back! Randy was our guide, better than I could imagined! Free roam in ocean and great time in inter costal water way, if you want a good jet ski rental this is the place to go!! Thanks to all staff! See yall next time! My husband and I rented two jet skis for the dolphin tour. It was a large group and most of us had never ridden one before. Given that, the tour guides gave very clear directions and always made sure everybody was doing okay throughout the trip. It was a 2.5 hr ride in total and we saw two dolphins! I thought I was going to be scared but they went at a fun pace and I challenged a few waves at 30+ miles per hour. Would totally do it again. Randy was the best? Had the best 2 hours with our crew. Keep up the good work my pal. We went to mytle beach for golf and ended up taking a day off to go jet skiing. All we talk about is the two hours on the water. Till next time. 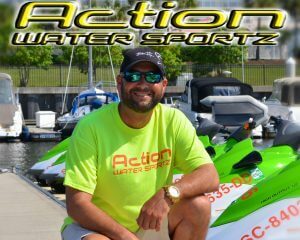 Anyone looking for a great experience action water sports is your place forget the others. Scott and his team are incredible. Our guide, Ben, took us to ocean, ordered up three dolphins for us to watch, showed us all the landmarks and a few tricks for navigating the back waters of the waterways. We will be back with family and friends. A great way to spend the day no matter if you’re vacationing or a local! Request Ben as your guide for the excursion–you I won’t be sorry! Today we did the dolphin tour and it was fantastic. Beautiful scenery on the way out to see the Dolphins. We went top speed most of the trip, the only slow time was in the no wake zones. Saw so many dolphins it was unbelievable. Definitely worth the time and money. Awesome time!!! Reservations are highly recommended. Call (843) 390-3333 to reserve your day in the sun. Ask about our current specials for both Myrtle Beach Jet Ski rentals and dolphin watch tours.